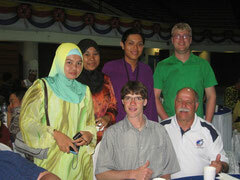 Kitefestival in Pasir Gudang, Malaysia.Already at the departure in Frankfurt, Volker met Bernhard Dingwert and Andreas Fischbacher. Arrived in Singapore, we met Ali and Mahid Buhamad from Kuwait and Team Thailand around Ron and Beav Spalding, to get a transfer across the border to Malaysia. Arrived at Hotel Selesa, we all took a rest and prepared ourselves for the next day at the kitefield.The Kitefield is in walking distance from the Hotel, in a park especially prepared for kiteflying. 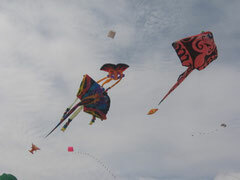 In the centre of the park, there is a Kite Museum showing the history of kites on donated kites from all over the world.The weather was warm as usual, every day between 30 and 35°C. But the humidity changed variously, from clear sky and burning sun to a strong and short rainfall during the Sultans visit on Saturday. This rain was definitly refreshing the kitefliers, good for the local agriculture, and the kites were dried after a short time flying in the warm wind after the rain.During all the days, the kitefliers had to challenge with the modest gusting wind, wich again and again tangeled the kites. Only in the late afternoon, the wind became more stable. After the lunchbreak, there was generally nearly no wind at all. This time was used by the International Teh Tarik group to settle down for a few minutes in one of the numerous makeshift food stalls around the kitefield. Teh Tarik is a malay speciality and very refreshing. http://en.wikipedia.org/wiki/Teh_tarik Another highlight was the world record attempt to fly 3000! Kites at the same time. 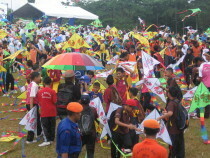 3000 pupils from the local school were equipped with kites sponsored obviously by an international chicken based fast food provider. When alle the young people started the kites on an area of the size of app. 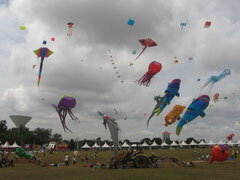 one soccer field, it looked like a big mess, but in fact I was surprised how many kites stayed in the air. 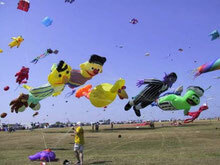 In fact, it was no wind at all, and the kites needed to be kept afloat by running. 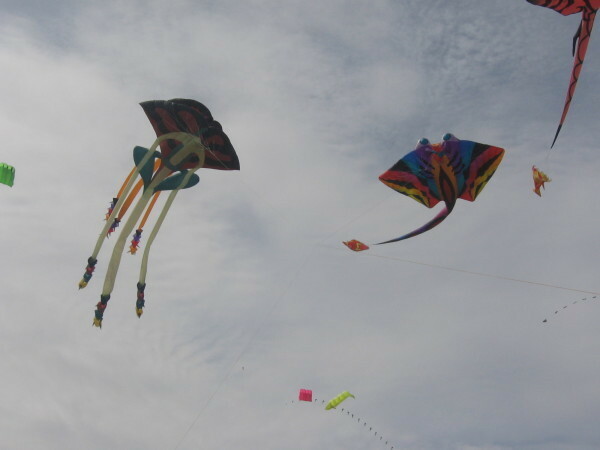 So we could witness 3000 kiterunner in a tiny area. It seemed that some of them ran for an hour to keep their kite in the air. That is admireable at 30°C. On Sunday evening there was the final dinner with the prize giving ceremony. Beside the international kitefestival and the world record attempt, there were many competitions for local kitefliers, i.e. Wau Bulan competition, train kite competition, fantasy kite competiton (including flying eggplants, pianos, tuk-tuks, various kinds of fish, the twin towers of Petronas in Kuala Lumpur and so on).After the Festival, I spent a day in Singapore, accompagnied by Bernhard and Andreas. 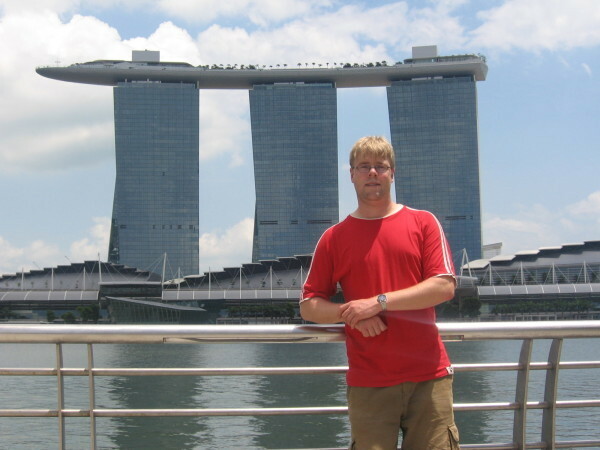 After having a birthday lunch with Bernhard, we visited Skypark, the roof terace of the Marina Bay Sands Hotel http://www.marinabaysands.com/SandsSkypark/Sands_Sky_Park.aspx What a great place. 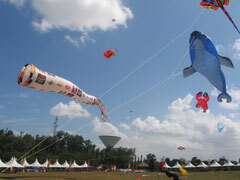 We immeadietly thought about a possible kitefestival at the terrace, 190m above Singapore. The infinity pool invited for a small, but spectacular ride for a kitesurfer. 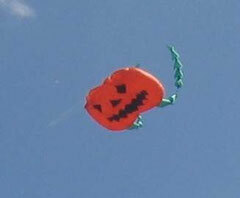 Indian kitefliers would love to fly their fighterkites on a roof at 190m. And even the great atmosphere at Skypark invites to spent some time up there. The relaxing background music up there were a real alternative to the music sometimes played on kitefestivals (including heavily hammering bass).Alltogether, Pasir Gudang is a great festival, including lots of sun (including heat), great malay food (including Teh Tarik), great people (including Ismail and Lee Poi Long) and in average good wind conditions (including lulls and guests).